Belinda Swanson, performs on both Baroque and Modern Violin. Currently she performs with the NC Baroque Orchestra and Collegium Vocale of Saint Louis. For five years she was the Music Director and violinist of the early music ensemble Seraphim Musica, which performed throughout North Carolina, in San Diego, and for various concert series in the Triangle Area including the “Sights and Sounds on Sundays” series at the NC Museum of Art and Duke Chapel Noon Concerts. 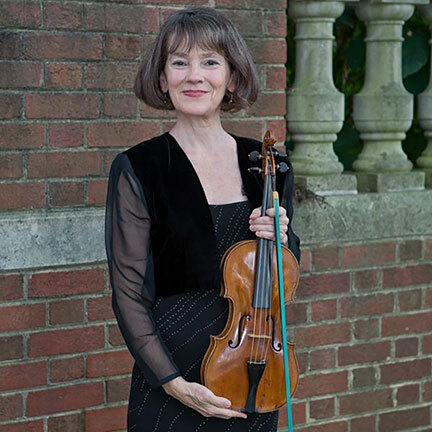 As a Modern violinist Belinda performed for a number of years with the North Carolina Symphony and was the Orchestra Contractor and first violinist of The Opera Company of North Carolina. Previously in the Washington DC area, she was a member of the first violin sections of The National Gallery Orchestra, The Washington DC Concert Opera, The Baltimore Opera, The Thomas Circle Singers Orchestra, The Harrisburg Symphony, and Concertmaster for The Thomas Circle Singers. She also performed free-lance with the Kennedy Center Opera Orchestra and The Wolftrap Filene Opera Orchestra. For period instrument concerts Belinda plays a violin made by Anton Fischer of Vienna circa 1780.